I have been a part of the North Star community since 2001. During that time I have worked both as a teacher and the Head of School. I have seen and played a vital role in the growth of North Star from an elementary school serving 20 families a year with one teacher to a well-established school serving in excess of 100 families a year with 15 faculty & staff. Each year my passion for Montessori education and supporting children & families continues to grow. This summer I enjoyed several short but sweet canoe & camping trips with my husband. 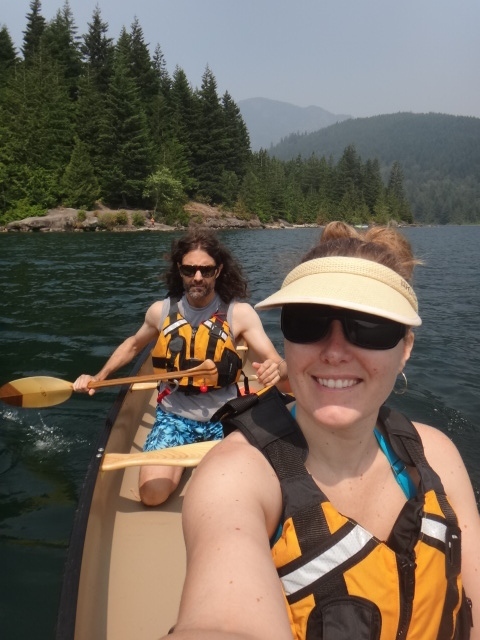 We canoed several local BC lakes including; Alouette Lake, Chilliwack Lake, Harrison Lake & some smaller, warmer lakes as well. I learned a lot about being prepared for, and safe in, extremely cold water. I am lucky to have a husband who is an expert white-water paddler. He taught me many paddling techniques, as well as valuable information about currents, hazards in swift moving water, and self-rescuing skills should we encounter trouble along the way. In addition to enjoying the pleasures BC’s natural environment has to offer, I traveled to Ontario to spend some time with family. My family is very important to me and I love spending time with them whenever I get the chance!